FLUID HANDLING SYSTEMS TO EXCEED PERFORMANCE DEMANDS. Thin, thick, volatile, or hazardous chemicals? We can help you find the best way to meet production and performance demands. 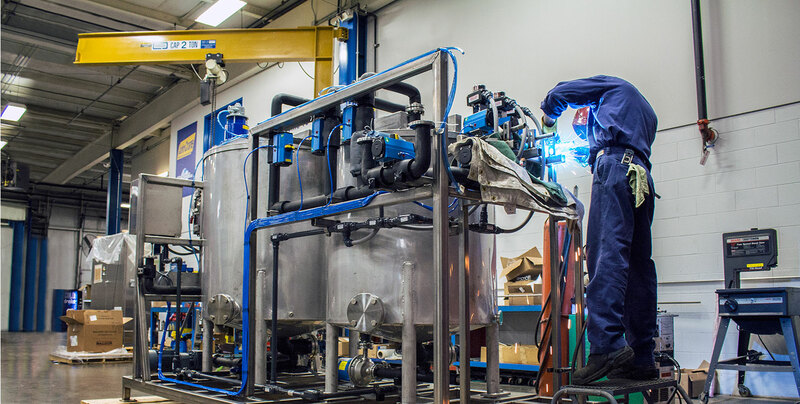 We'll help ensure the fluid system solution you put in place will lower operating costs through improved production efficienct, extended equipment lifecycles, and reduced energy consumption. Talk to one of our Engineers today. More than just talk, we have documented examples of improvements we've helped to make with chemical manufacturers. Keep chemical erosion at bay with corrosion resistant floor coatings and tank liners. Chemical exposure is bad news for concrete, fiberglass, and just about anything else chemicals come in contact with. Call on Crane Engineering to provide a high performance floor coating or tank liner to protect from erosion and damage, while increasing safety in your facility. Read our success stories to see how we've helped food processors protect themselves.